HOBBS - A Hobbs man accused of poaching two trophy mule deer faces possible criminal penalties of $1,600 and up to six months in jail, and civil penalties of up to $10,000. Bradley A. Smith, 24, was arrested Jan. 12 and charged with two counts of unlawful killing of deer and two counts of unlawful possession of deer in connection with a poaching incident south of Hobbs in Lea County . Jeremy Stane, 28, and Summer Stane, 26, also were charged with unlawful possession of deer for their alleged involvement in the case. Smith pleaded not guilty and is scheduled to appear Feb. 23 before Judge Lemma White in Hobbs Magistrate Court . His bond originally was set at $20,000 by Hobbs Magistrate Jack Bailey, and then was reduced to $1,000 by Judge White. Jeremy and Summer Stane are scheduled to appear before Judge White on Feb. 9. Jeremy Stane faces penalties of $800 and up to six months in jail for two counts of unlawful possession of deer, and Summer Stane faces penalties of $400 and up to six months in jail for one count of illegal possession of a deer. Smith's arrest followed a report to the Department of Game and Fish Operation Game Thief hotline from a citizen who witnessed a trophy-class mule deer shot out of season. Search warrants served by Department conservation officers, New Mexico State Police, Lea County Sheriff's Office and the Hobbs Police Department for two homes led to the seizure of evidence including 32-inch and 24-inch sets of deer antlers. Extra Department of Game and Fish officers, including commissioned area office specialists, assisted in the search warrant executions. The 32-inch set of antlers was scored at 202 3/8 inches according to the Safari Club International system. The score qualifies the deer as a "trophy" according to new standards adopted by the state Legislature and the State Game Commission. Depending on the outcome of the court case, the Department will decide whether to pursue civil penalties to recover the state's loss of a trophy game animal. Civil penalties for poaching a deer that scores 200 or more inches on the SCI system can be as high as $10,000. 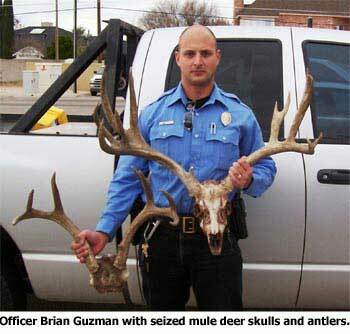 "The new civil penalties will send a strong message to anyone thinking about stealing New Mexico 's wildlife," said Hobbs District Conservation Officer Brian Guzman, the lead investigator on the case. "We need to protect our wildlife resources against poaching." The Department encourages anyone with information about violations of New Mexico 's wildlife laws to call Operation Game Thief toll-free, (800) 432-4263, or to visit www.wildlife.state.nm.us . Reporters can remain anonymous and earn rewards if information leads to charges being filed. ALBUQUERQUE - Hunters have until Saturday, Feb. 3, to mail or submit online applications for 2007-2008 oryx licenses, bear Wildlife Management Area permits, population reduction hunts and special spring turkey permits. To be eligible for the drawing, hunters who held deer or elk licenses for the 2006-2007 season also must have reported their harvest results before the Feb. 3 application deadline. Applications must be postmarked or sent via the Department of Game and Fish Web site by midnight MST Feb. 3. Hunters are encouraged to use the web site, www.wildlife.state.nm.us , as the most convenient way to apply. Written applications and 2007-2008 Rules and Information Booklets are available at license vendors statewide and at Department offices in Santa Fe , Albuquerque , Raton, Roswell and Las Cruces . All deer and elk hunters who held licenses for the 2006-2007 season are required to report their harvest results - whether they were successful or not - prior to applying for any drawing hunts for 2007-2008. Reporting deadlines are Feb. 3 if hunters plan to apply for oryx, bear WMA, population reduction, or special spring turkey hunts. The reporting deadline is Feb. 15 for hunters wishing to apply for any other public land drawing hunts. Hunters who miss the reporting deadline may still report and be eligible for drawings if they report before the drawing deadline and pay a late fee. Failure to report will result in all applications for public drawing hunts, landowner authorizations and applications for species other than deer or elk, being rejected for the following season. Reporting takes only minutes, either by calling toll-free, (888) 248-6866 or online by visiting www.newmexico-hunt.com . For more information and complete details about mandatory harvest reporting or the special hunt drawings, please visit the Department Web site, www.wildlife.state.nm.us , or call (505) 476-8000. ALBUQUERQUE - It's never too early to prepare for the upcoming hunting and fishing season, and there's no better way to start out the year than by attending the annual Bob Gerding Outdoor Adventures Hunting and Fishing Show - Feb. 9-11 at EXPO New Mexico in the Manuel Lujan Building . Hunters and anglers can see the latest styles in camp trailers and equipment, or book a guided hunting or fishing trip. The Department of Game and Fish will be there to answer questions, and a computer will be available for hunters to report their harvest. Anyone who is licensed to hunt elk, deer or take furbearers on public or private land must report. The reporting deadline for deer and elk is Feb. 15, 2007, and the deadline for furbearers is March 15, 2007. Hunters and fishermen also will be able to pick up the new Big Game & Trapper Rules and Information Booklet, and applications for 2007-2008 hunts. Parents are encouraged to bring their children along to shoot a few rounds at the indoor pellet gun range or try their skills with the laser shot hunting simulator provided by the New Mexico Game and Fish Hunter Education Program. Admission is $7 for adults, free to children age 11 and under. For more information, please call (505) 299-5204.